Hey you guys!! Its occurred to me that maybe I haven't shared my love of Faery Ink images with you quite enough! And I want to!! 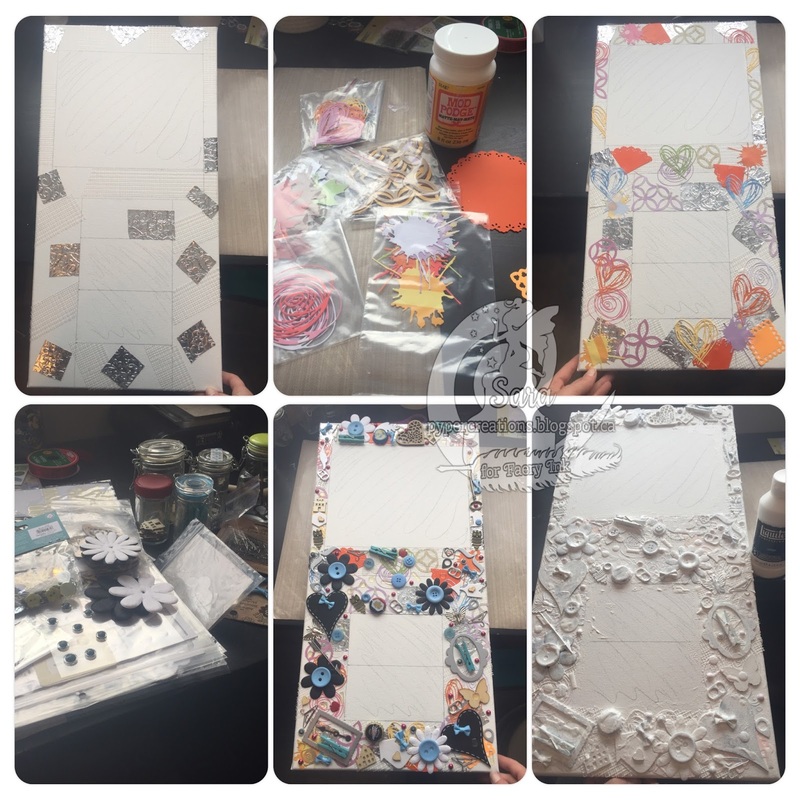 I want to share with you all the beautiful images Amanda has created and help you turn them into something you will be so proud of!! I've been so busy this last year between going back to work more part time, and camping season and the 4 design teams! LOL I've decided to go down to just the 2 teams (if Aurora Wings and Faery Ink decide to keep me around) in the New Year so that I can focus more on the images I love to work with! I know that these lovely ladies have us around to help them promote their images all over the web whether its on our various Facebook Groups, our Pinterest pages, our own personal blogs, business pages, where ever it might grab someone attention. Our goal as designers is to get you interested and excited in not only the images we are working with but the projects we are creating! Our job is to inspire you! 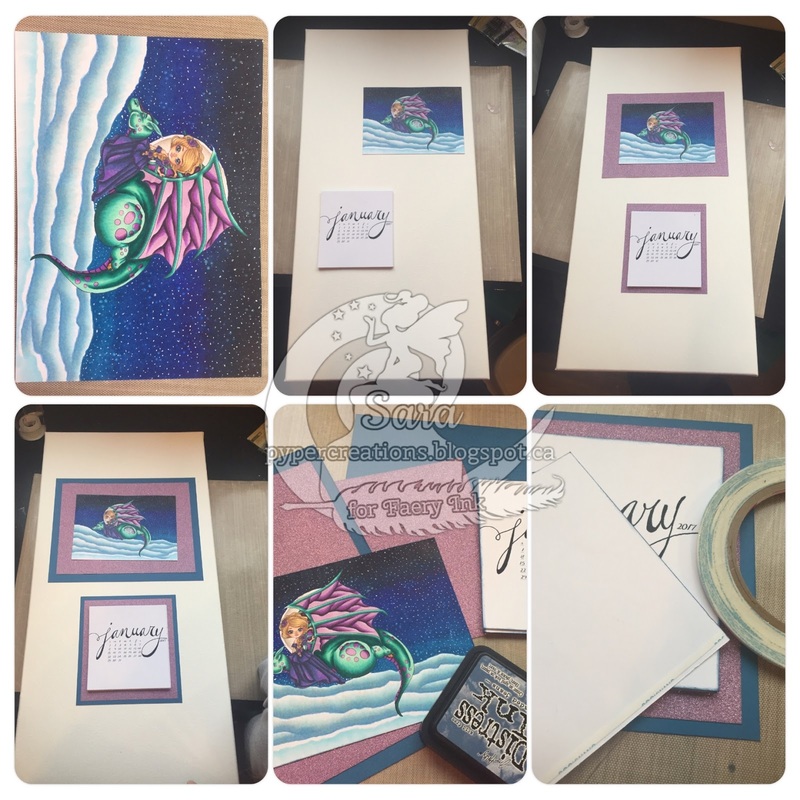 With that in mind I thought I would take some time today to highlight some of my favorite Faery Ink projects that I've done, pop in with an all new Mixed Media Canvas and some sweet simple cards with a couple Faery Ink Freebie images! 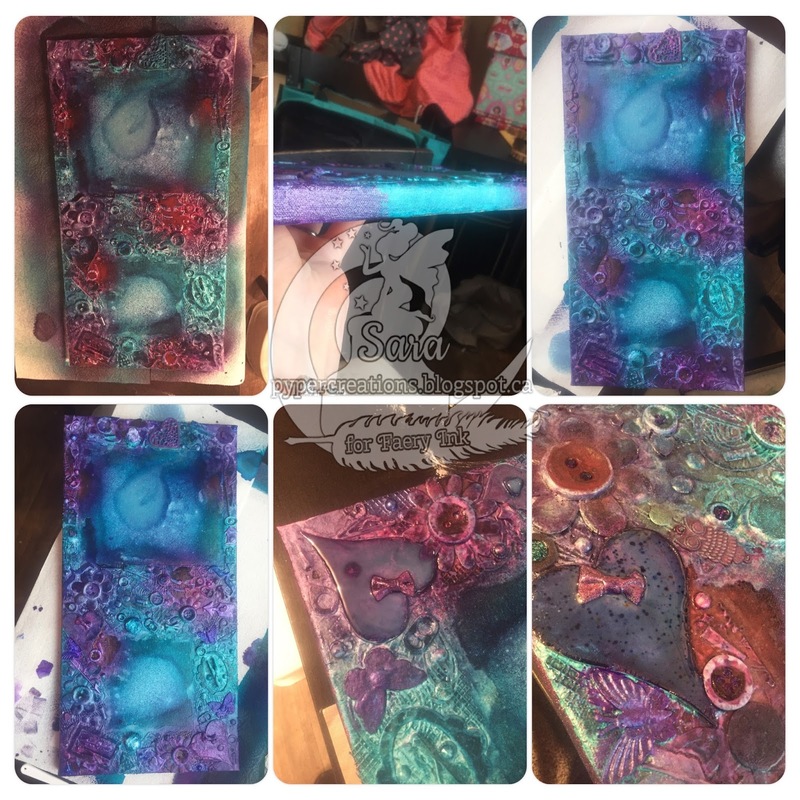 I've been working with Faery Ink images for just over a year so (since Kit and Clowder did a monthly class with the adorable Gabbie Halloween Witchfire) if you pop Faery Ink into that search bar over on the right there you will find a ton of projects I have done. Although I have barely touched the tip of the iceberg on the 86 images I've collected between different freebies, one dae faes, purchases and of course being on the last Design Team. Let's go back to my first Faery Ink project, a mixed media Halloween Door sign I did with the Kit and Clowder monthly classes back in October of 2015. You can see how much I've learned since then!! LOL I still love this project so much!! The Gabbie Halloween Witchfire image is beyond adorable!! For this project I did the Kit and Clowder Monthly class with my copic markers and it took hhhoooouuuurrrrssss!!! But was totally worth it!! Then I picked up this cauldron shaped door hanger at my local Micheals. 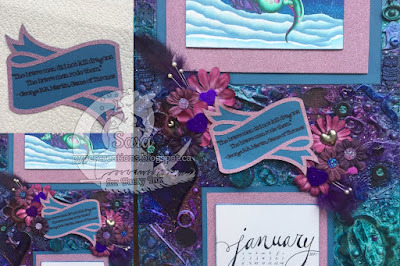 Some of the embellishments like the picket fence and poison were cut with my cricut, others were sent to me in the Faery Ink Swap just a few weeks before. The flowers and gems I mostly had kicking around. I even put stickles and liquid glass on some of the embellishments to help make them pop or to make them look more realistic. If you would like to see a little more about this project please visit the original post HERE. You can see how much I am learning from my monthly classes from one picture to the next ey! I think its so important to keep challenging yourself and learning new things and stepping outside you comfort zone. Man, did I do that with Lahla Uni-girl here!! I was so thrilled when she came out as a special Faery Ink 13th Birthday gift for us all!! I think I literally squealed didn't I, Amanda? 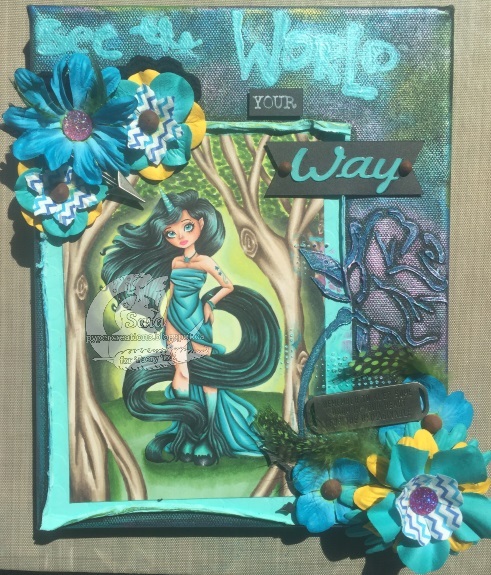 To create this mixed media canvas I started by coloring up with image with my favorite alcohol markers- Copics and different lessons from my Kit and Clowder classes, I know I used Skin and Hair, and the Woodland Scene in the Elements of Nature class. Once I had it colored I took different techniques like using modeling paste, mists, and Inca golds, that I have learned from taking classes with Chelsey Vorosmarty to create the background of my canvas. Then I took different flowers and gem and a Tim Holtz saying to give it the finished look. If you would like to learn more about what I did to create this take a look at the original post HERE. I still love looking up at this one on the wall in my scrap booking room!! Makes me so happy!! Now I thought I would show you something totally new here today real quick too!! This is my daughters Christmas present from mommy... a 2017 Calendar for her room. Usually I do them calendars with 12x12 scrapbook layouts for each month but this year my hubby and I decided to try something new! I made them each beautiful mixed media canvas' (which are probably my favorite to do) with little mini calendars on them. When you ask the little one what her favorite animal is or what she wants for Christmas she will tell you a Dragon. And she will tell you her favorite color is purple... and so I took Bella Dragon Rider and got to work!! Now since I only have about 7 hours a week to create and writing this post has take half of it 😉😉😉 we are gonna do a quick little mini photo tutorial of how I put that all together! We will start with the already colored image. (Coloring this puppy took about 5 hours and you don't wanna watch all of that!!! Next I played with layout and paper choices. I decided to center my two pieces one centered in the top half and one centered in the bottom half. I edged all the pieces including the calendar (which I got HERE) with Tim Holtz Faded Jeans distress ink. 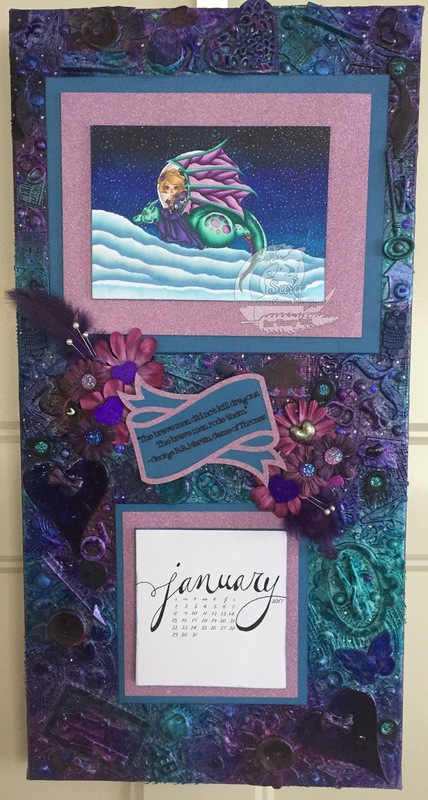 Then I used my 3M Score tape to attach each month of the calendar squarely to the one below it and on the glitter and on to the CTMH cardstock. For the image I wanted it to have some dimension so I used just dollar store foam tape to attach the image to the purple glitter and the glitter to the cardstock but I put 3M Score tape on the back of the cardstock to eventually attach to the canvas. Next I got out a ruler and pencil and marked exactly where these 2 pieces will go so that in all the next steps I don't run out of room for them! Don't worry about how messy it is or if you can see the lines I promise within the next few steps you will NEVER know they are there!! Now for the really fun part!! I took Backers Tape (originally designed for Dry-walling I believe) and Heat Duct Tape (meant for going around and sealing the heating ducks in your house) and used it to create texture. The Backers Tape just going right on the canvas as is... 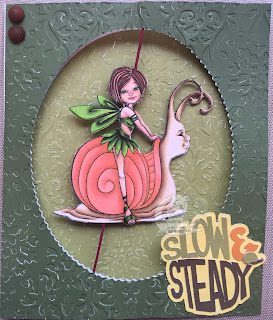 The Heat Tape goes through your Big Shot (cuttle bug, whatever you have) in an embossing folder, I used a swirly butterfly one from Sizzix; then peel the backing off and lay it down where ever you want as long as you stay OUTSIDE you boxes that you drew in. Then I took some different die cuts that I cut in mass a month ago with my bestie but I cut them in pattern paper that I never have anything to match to so they have been sitting unused which is a travesty!! So grab the Modge Podge or matte medium and get em on there. Again it doesn't matter where, the goal here is to create texture and interest. Here's the best part!!! Go to your embellishment bins... you know the ones in the very back corner covered in dust, creaking drawers cuz its been forever since you've been in there? Ya those ones, the long forgotten never used, out of style or not your style anymore. Man just go to the recycling bin and grab some metal bottle caps (yup I have some on there!!) or pop tabs from pop cans, whatever you've got kicking around that will add texture and dimension. PLEASE PLEASE do not worry about colors or matching or anything like that!!! It will not matter!! Glue that stuff down. Everywhere. Make a hot mess. Seriously, get the glue gun out and make a hot mess. The whole goal is to create interest, and depth, and texture. It looks like we are crazy right now doesn't it? We kinda are.. my hubby says I am... and I LOVE it!!! Once you are sure your glue is all dry get out some Gesso. I currently have Liquitex Gesso in white. I know Basics makes one and Bo Bunny has a Gesso and you can get both white and black. I've never used black I have no idea if that would work with this project... if that's what you got give it a go!! Coat is all!! Every last square inch cover it in Gesso. 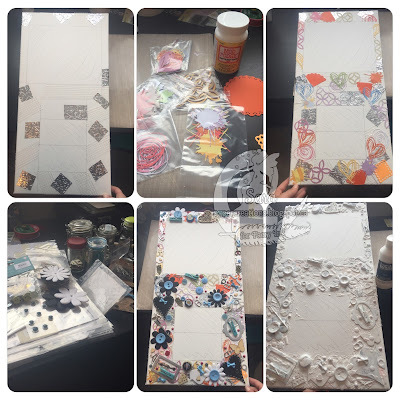 Make sure you have all the little hiding edges of all those glued on embellishments, Just slather that stuff on. 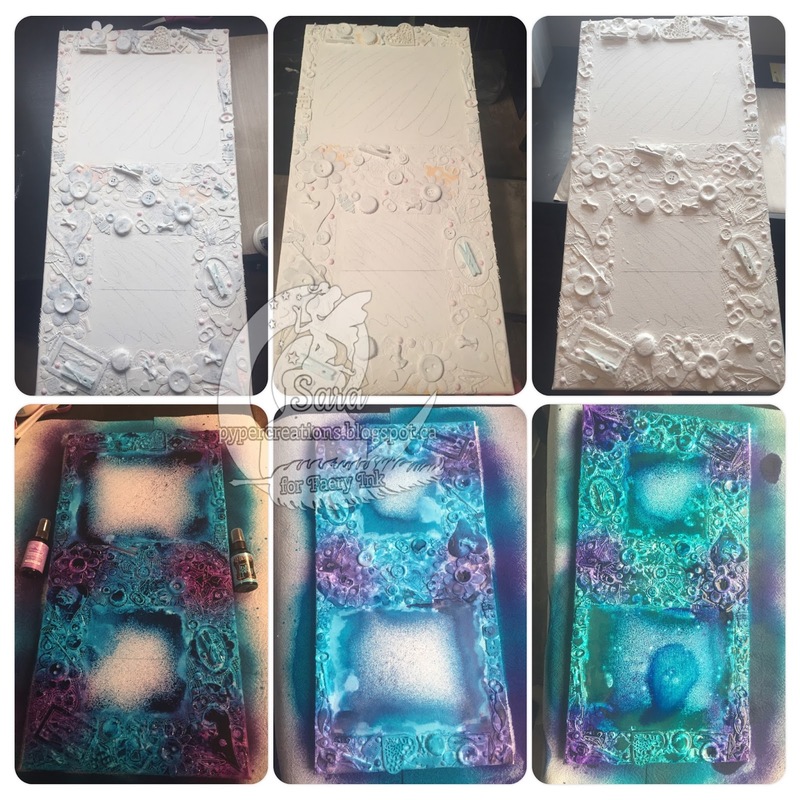 We are making a completely blank canvas again to work our mixed media magic on so you don't want the god awful bright red Christmas chipboard piece Aunt Cecil gave you 10 years ago cuz she saw it at the flea market and thought you would love it, that thing we don't want that showing! Now walk away... why are you still here? We want that Gesso to get good and dry before we do another coat. I'm gonna go back lunches, do dishes, maybe dress my kids in snowsuits to go play in the freshly fallen snow, that alone will take an hour bahahhahah see you later! I have know applied 3 layers of Gesso and let it dry between each layer. The next step is the really messy one!! Mists!! For this canvas I used Adirondack Color wash Purple Twilight and Dylusions Calypso Teal for the first layer of mist. The middle picture in the bottom is how pretty it looks all dry!! But its not shiny and I do want lots of shine and glimmer for this project so for my next layer of mist I ended up using Tim Holtz Dusty Concord distress stain (I ran out of ALL my purple mists... we only have 3 crafty stores close to home... one has more of a raspberry color (Which I bought! LOL) but its not the right shade for this. One had a Vineyard color (which I bought but its BLUE?? Even the color strip is purple!) and the other is Michaels which only has them in 3 packs and is of course the 1st place I looked and is the farthest away from home to go back to) so distress stain it is! The other mist I used for this layer is a Color Bloom Deep Teal. I'm hoping that it will mix with the Calypso and end up a dark shiny teal/blue but we shall see in a few hours when they dry again! Isn't that just lovely!!!! I did add a Color Bloom Boysenberry mist to the mix too just for pop of a little brighter color!! Then I used Viva 3D Stamp Paint in Magenta to paint the edges and the hearts. My daughters whole room is decorated in hearts so I really wanted to pop these heart pieces out! 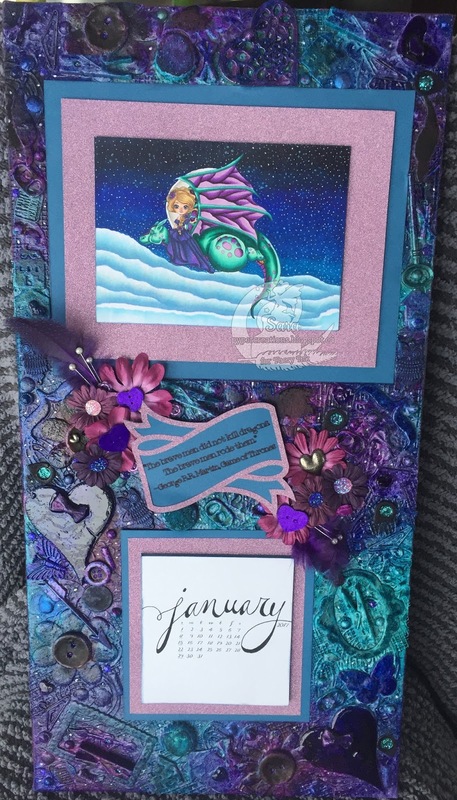 I also used some Finnabair snowflake paste, Silks in Snap Dragon, Inca Gold in Both Cobalt Blue and Violet. I let all that dry. Then I came back in with my CTMH liquid glass and covered all those hearts again. Believe me this is gonna magnify the already awesome sparkle once its dry. I also Used some Perfect Pearl and other Mica powders to coat a few different pieces I really wanted to pop out. 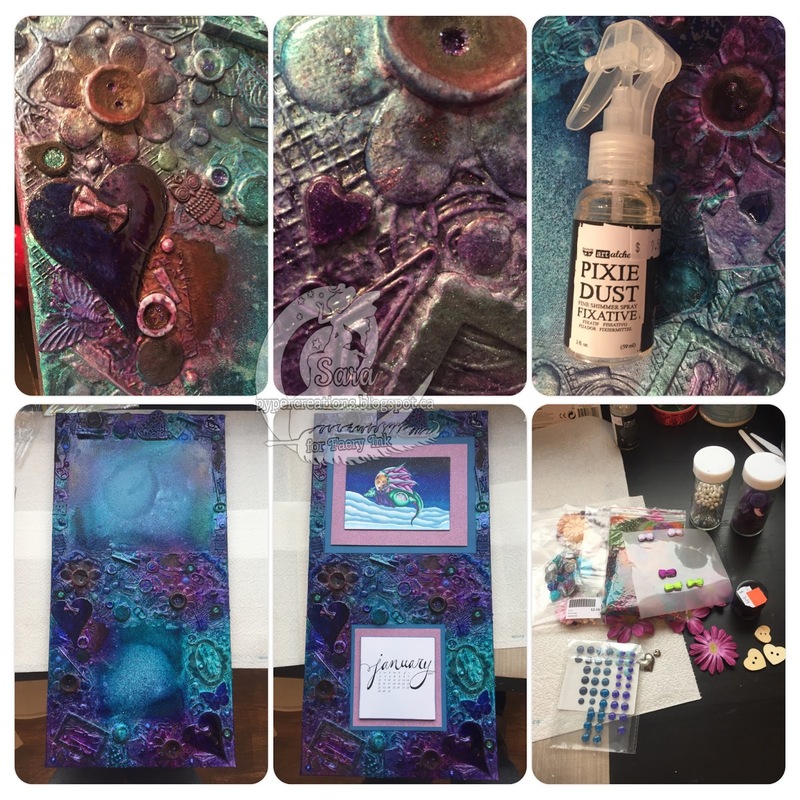 And of course Stickles, what's a glittery mixed media canvas without some Stickles!? The last picture there I hope shows a good example of what all those different mediums have done in a small space. You can see some Micas shining and the 3D paint on that bow there, the liquid glass around it but its not dry yet have patience young grasshopper! LOL You cam see some stickles and some Inca gold and some silks. Just lots of different shimmery looks there. The next step is to seal it all in. For this I have used art-alchemy's Pixie Dust Fixative. Its a sealer that has a built in shimmer! Gotta love that!! You could use a Kryon fixative just the same. Spray it over everything! Doesn't it look so pretty!!! I love it!! Then I pulled the 3M Score Tape backing off my image and my calendar and stuck them down! The fit perfectly in the holes we left for them!! Now its time for the finishing touches! Grab out whatever embellishments you had in mind for finishing this off. In my case we are highlighting purple and hearts.... So here we go!! I took the quote I wanted to use and worked in my Cricut Design Space program to create this adorable banner for the center of the canvas. My Cricut Explore Air has the ability to write out what I want written on something for me so little projects like that banner are a total breeze and come out perfectly aligned and un-smudged every time! You could of course use a stamp quote or alphabet stamps to stamp what you wanted on a banner or shape of your choice. You could print it out of a word processing program as well. Soooo many options! Then I laid out all the little embellishments I wanted to use. I always find that the once everything is glued down its placed just a little differently than I had originally thought lol but the general idea is usually the same. At the end for an added touch I took some CTMH Create a Shade paint, its like a white shimmer paint you can mix with a re-inker or something like that to create whatever color shimmer paint you want. For me, this time, I used it the way it comes with a fine tipped paint brush to add little stars all over the canvas. This is what I ended up with!! A few close ups for you of all the different areas. I really wanted you to get a feel for what the finished project looks like up close. You can see all those different shimmers, shines, and colors all blended together to create one very shiny, very beautiful piece of art!! I don't wanna toot my own horn or anything but MAN that looks good!!!! I took pictures in a few different places in the house since everywhere has a little different lighting, LOL! I just wanted you to see everything you have walked along with me creating these last few days!! Thanks so much for coming on this journey with me!! 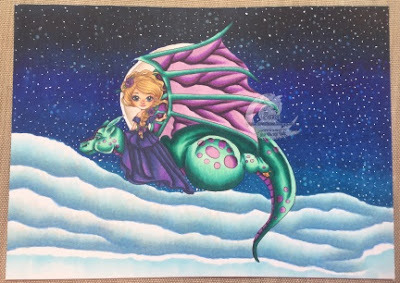 I have had so much fun putting this together with this stunning "Bella Dragon Rider" image from Faery Ink!! And its been a blast walking you through all the steps!! 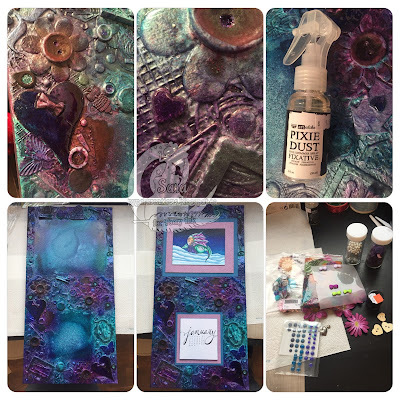 I really hope to see some of you try these techniques and share them with us all in the Faery Ink Facebook Group soon!! I do believe I promised a couple sweet and simple cards from FREEBIE images didn't I? Let's do that next!! 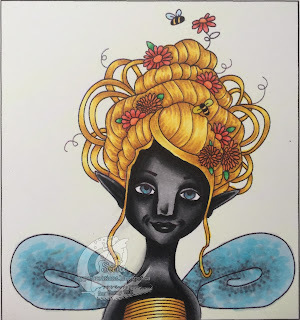 This first one I used the adorable Faery Queen Bee. I love how different and unique she is!! Like a hive of hair on head!! So different!!! 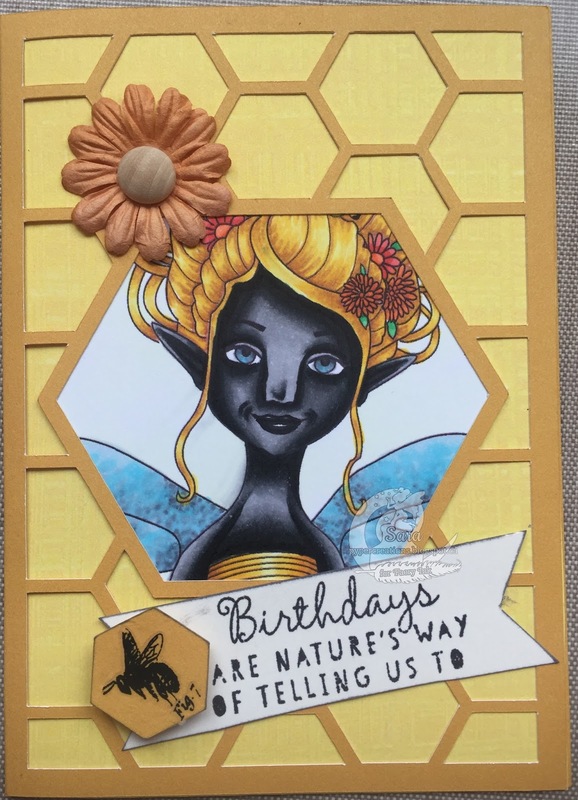 So I had to color her up to look like a bee... then I designed the card using CTMH Artfully Sent cricut cartridge and my Design Space program. 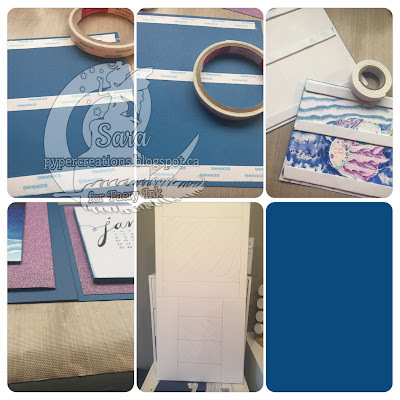 The cardstock is CTMH Honey and Colonial white. I just did a little edging with Tim Holtz Hickey Smokes distress in and stamped the CTMH Birthday Funnies stamp with CTMH black ink. The little honeycomb is a product of cutting the card base and I added just a couple small Tim Holtz Botanical run ons to it. 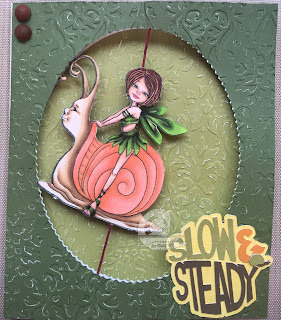 For the second one I used Snickerdoodle and the Snail to create this adorable spinner card!! I cannot get enough of the sense of attitude you pick up from Snickerdoodle when you look at her! I love it!! 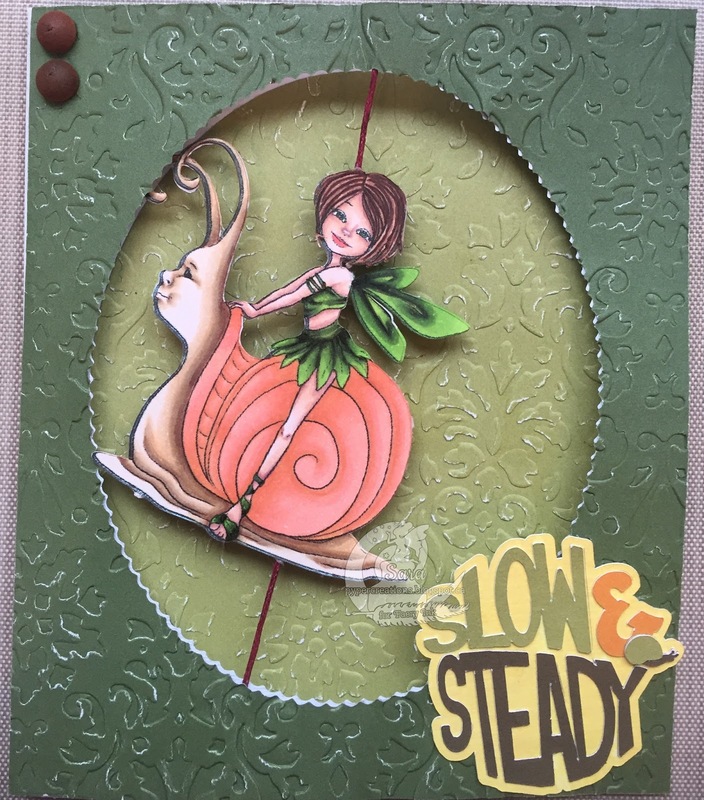 I used THIS tutorial to make this spinner card as I have never done one before. But I can tell you I will do it again!! So much fun!!! 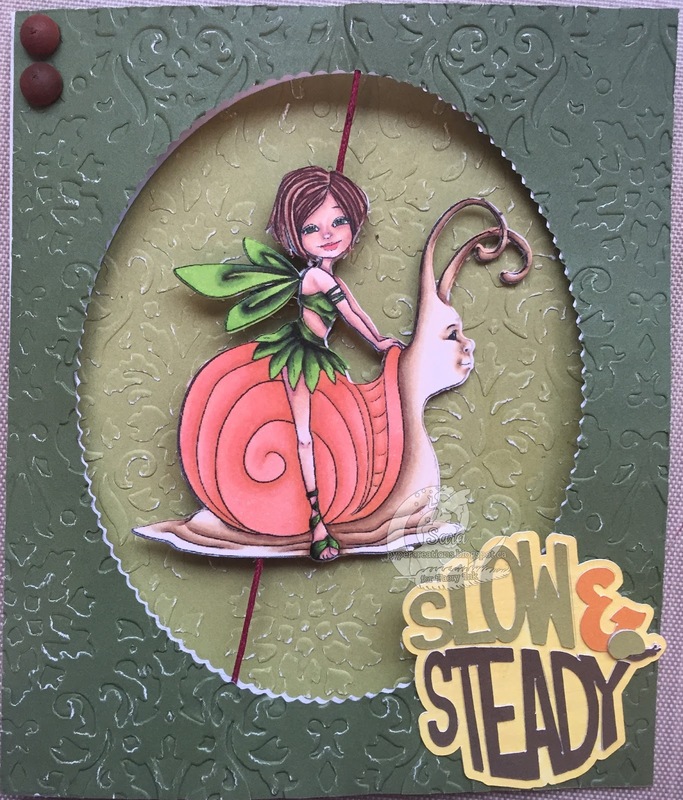 I used a collection of CTMH cardstocks and damask embossing folder to create this as well as the Cricut Garden Soup cartridge. I love the final effect!!! Thanks for coming on this little artistic journey with me today! I hope you have learned a little about me, about the things I love (like Faery Ink images) and maybe a new technique or two to take with you into your own crafting adventure!!! What a fantastic post Sara! 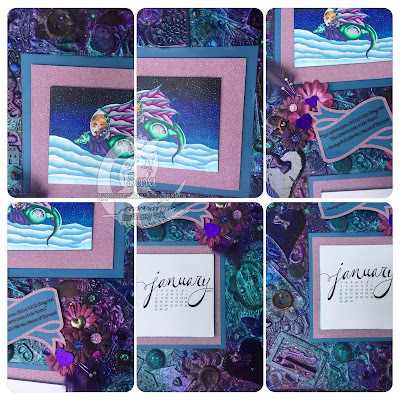 You are so generous to create this walkthrough for your beautiful calendar =) Your coloring has grown so much. Amazing work! Thank you!! I really had so much fun!! It amazes me to look back and see what I've learned! WONDERFUL projects and post Sara!!! 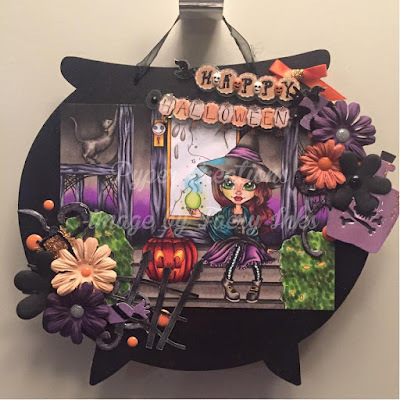 WOW - THANK YOU for sharing your AMAZING canvas and tutorial too!!! Oh I'm so glad!! It's so much fun to get so messy!!! Let me know if you need a hand working with new products!! I'd love to help!! wow - what a great project - it was worth the work and time. my favorite colors too. great work - you created a materpiece! I haven't attempted anything like this, but will try someday - yes - i have a bin of 'embellishments' that I have no idea what to do with. Absolutely gorgeous work. Love it.